Important: if you are running a licensed old version of xSQL Builder and your license was purchased before February 21, 2013 then you might want to hold off on installing the new version until you have made the decision to upgrade since the new version overwrites the old and your license does not support the new version. Of course you can always try the new version on a different machine. When installing our comparison tools (SQL Schema Compare and SQL Data Compare) on a Windows 8 machine the installation may fail with the message “SQL Server Comparison Bundle v4 Setup Wizard ended prematurely because of an error” (see screen shot below). Cause: by default on a Windows 8 machine only .NET Framework 4.5 is enabled whereas previous versions of the .NET Framework are not enabled. Solution: enable .NET Framework 3.5 (this includes .NET 3 and .NET 2) on your machine. To do this go to Control Panel / Programs / Programs and Features / Turn Windows Features on or off and then check the “.NET Framework 3.5.1” checkbox and click OK (the machine needs to be connected to the Internet while this is being done. 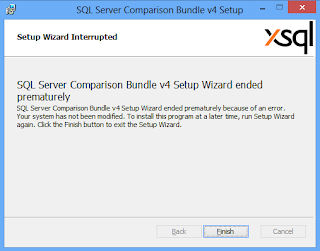 After enabling .NET Framework 3.5.1 re-run the installation of xSQL Comparison Bundle and it should install without a problem. Fixes an issue with the GUI scaling on different resolution/DPI settings (both, schema and data compare). Fixes an issue with user membership to roles (schema compare). Fixes a bug related to the order of the included columns in an index (schema compare). Adds two new command line options for the data compare where clauses, allowing you to set different filters on each table/view on the pair (data compare).